Update November 1: Tickets go on sale November 5 -- they're $34.95 and up. It's true: Ariana Grande is set play a show at the TU Center March 18. 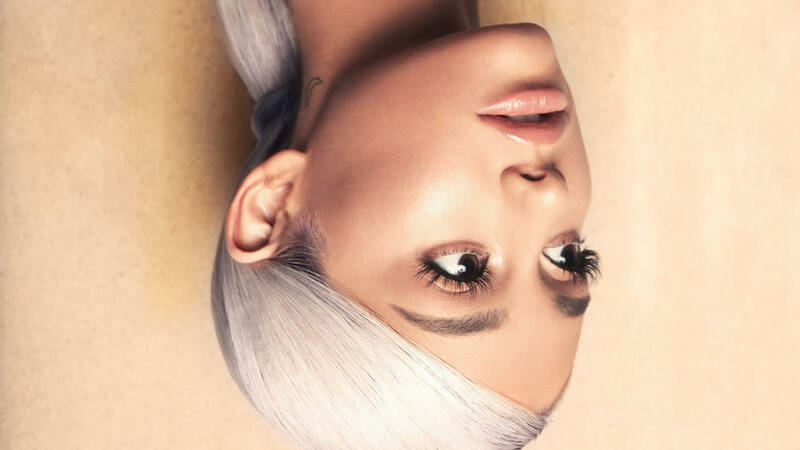 It's the first top on her upcoming Sweetener tour. Word of the show popped up this week when her website posted tour dates. A little bit oddly, though, the typical venue and ticket sale info didn't immediately follow. (These announcements are usually coordinated.) But on Friday the Times Union Center confirmed the date and posted a note: "Ticket prices and onsale information coming soon." This will be a popular show. Grande is a huge star whose fame transcends music. Keep an eye out for when tickets go on sale if you'd like to go. The alt rock / folk rock act has a new album -- Delta -- coming out in November, and the tour has the same name. Also: It sounds like the show will involve some sort of theater-in-the-round type of stage. It looks like Maggie Rogers will be the opener for the TU Center show. 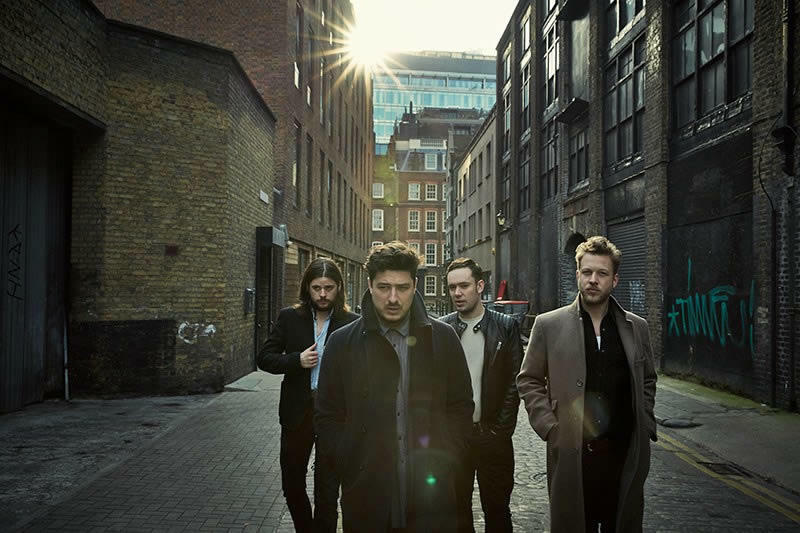 Mumford & Sons played a show at SPAC in the summer of 2016 and it sold out well ahead of time. So if you'd like to catch this show, it's not a bad idea to get tickets earlier rather than later. 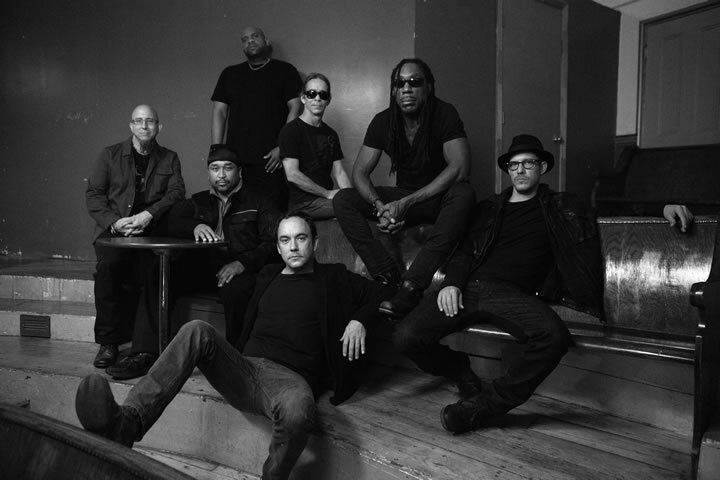 DMB released a new studio album this past June, its first in six years. Come Tomorrow debuted at #1 on the Billboard 200 chart. And the band made its annual migration to SPAC this past summer. 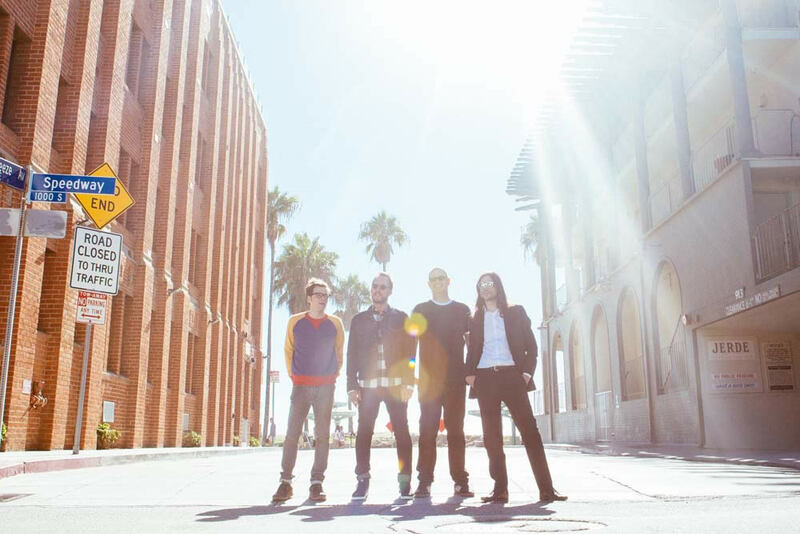 The TU Center show is part of 10-city fall tour along the East Coast. 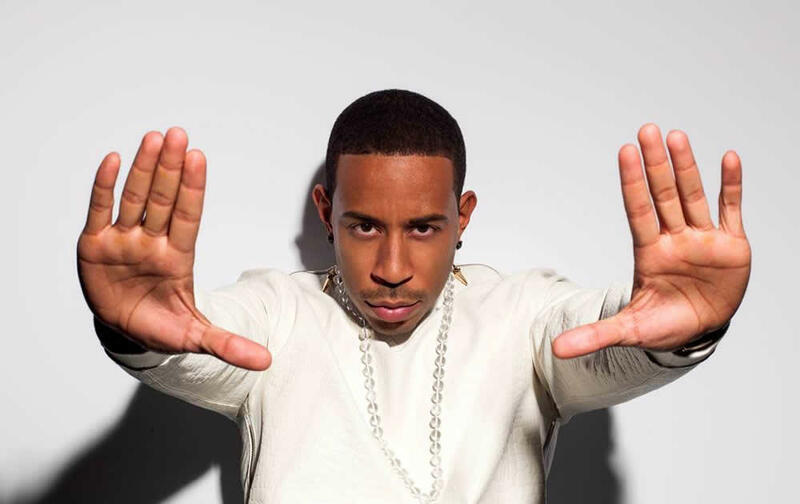 Ludacris is set to play a show at the Times Union Center August 11. Tickets go on sale this Friday, July 13 -- they're $50 and up. Joining the rapper/actor as a headliner for the show: rapper/songwriter August Alsina. And the lineup also includes DJ Nick Lake, DJ Ted Smooth, MC/Actor Lou Pizarro, MC/Actor Teddy G, MC/Actor Jeremy. The TU Center show is part of Timberlake's tour for his Man of the Woods album. By the way: While looking for info for this show, we checked in on the tickets for the Elton John show at TU Center next March. They went on sale in February and it looks like the only tickets now available are "verified resale tickets" starting at... $152. Let's look ahead to the weekend: One of the NCAA women's basketball regionals will be at the TU Center this Saturday and the following Monday. The series of three games will decide one of the teams for the women's tournament final four. + There's a very good chance that one of the teams will be undefeated, #1 ranked UConn -- women's college basketball's Death Star just has to find a way to somehow slip past the powerhouse that is Quinnipiac. The Huskies beat St. Francis (PA) in the first round 140-52. Yep, 140-52. Presuming they win Monday night, they'll bring a big crowd to Albany. UConn has won the title 11 times. + And the group of four already includes #2 seed South Carolina, which won the title last year. All-session tickets for the games at the TU Center start at $40 for adults / $20 for kids and seniors. Single-session tickets start at $21 for adults / $12 for kids. 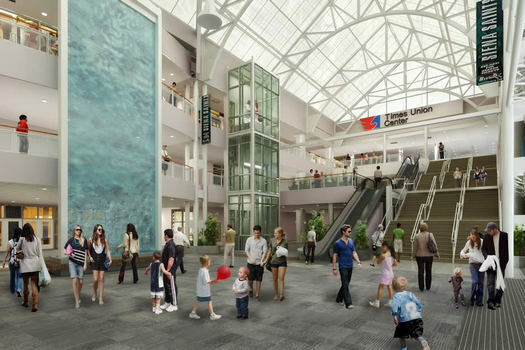 Future years: The TU Center is set to host the women's tournament again in 2019, and the men's tournament in 2020. 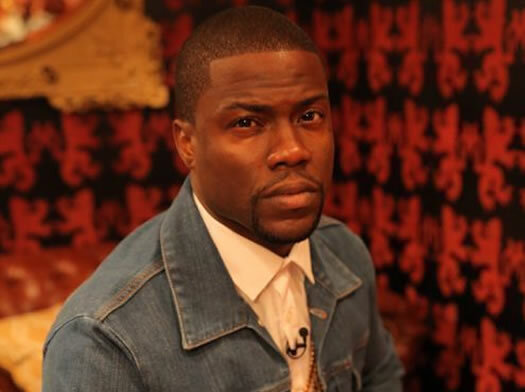 The concert will also include a "Light It Up pre-show party" with comedian Jim Breuer, "featuring great tunes, comedy, giveaways and much more." Metallica first started in 1981. It released its 10th studio album -- Hardwired... to Self-Destruct -- in November 2016, and this show is part of the ongoing tour in support of that album. * Tangental bit: That is just about the highest starting ticket price around here that we can remember. (The string of sold-out Garth Brooks shows last year also started at $65, and the Chainsmokers at the TU Center last year started at $60.50.) 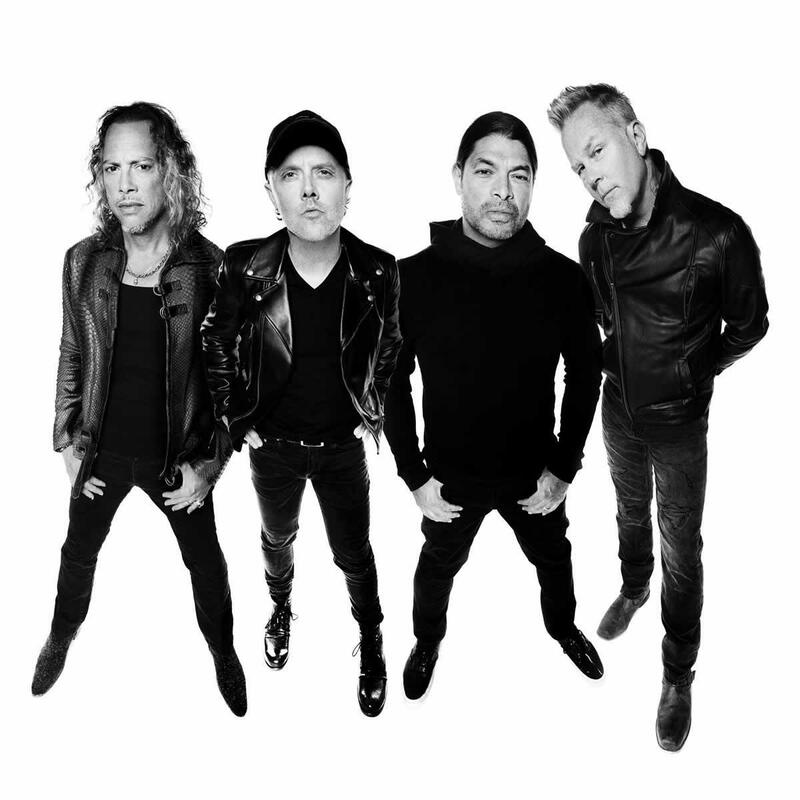 Metallica had the fifth-highest grossing tour of 2017 -- $152.8 million on almost 1.6 million tickets sold -- according to Pollstar. Kicking off in the U.S. on September 8, 2018, the 'Farewell Yellow Brick Road' tour will consist of more than 300 shows across five continents, hitting North America, Europe, Asia, South America and Australasia before reaching its conclusion in 2021. These dates mark the superstar's last-ever tour, the end of half a century on the road for one of pop culture's most enduring performers. 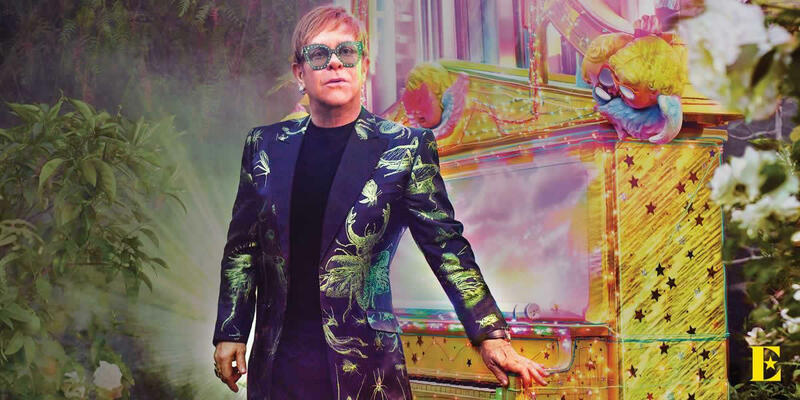 Elton's new stage production will take his fans on a musical and highly visual journey spanning a 50-year career of hits like no one has ever seen before. John is now 70 years old. 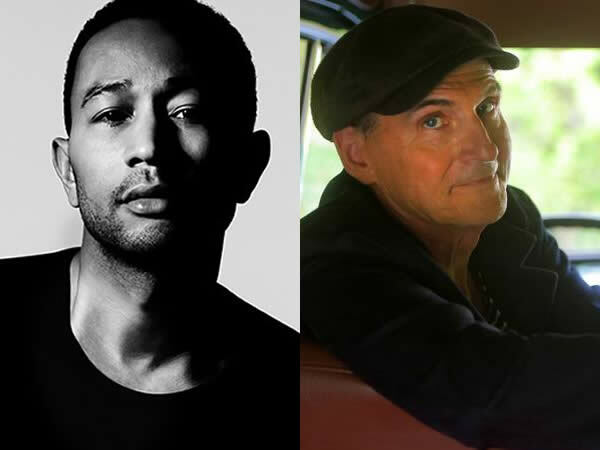 The Times Union Center is holding a "grand re-opening celebration" January 26 and the event is headlined by John Legend and James Taylor. Tickets go on sale this Saturday, December 16 -- they're $62 and up. The event will also include a performance by Moriah Formica. And it'll be hosted by Jim Belushi. John Legend is, of course, very popular and has won a ton of Grammys. And James Taylor is an icon who sells out multiple shows at Tanglewood every summer. So, there's a good chance this event will also sell out. 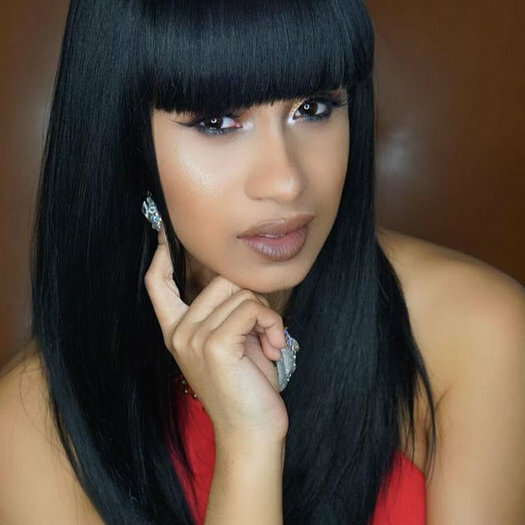 Rapper Cardi B is headlining a "Homecoming Concert 2017" show at the TU Center October 21. Tickets went on sale this past Friday -- they're $45 and up for the general public, $30 and up for students with valid college ID. Her ascent up the mountain of fame has followed a very modern path: stripper, to Instagram star, to reality TV star, to major label rap star. The lineup for the TU Center is co-headlined by reggae/dancehall singer Charly Black, and includes Famous Dex and Lil Pump. The duo has had some hugely popular songs over the past year or so. Among those hits is "Closer," which hit #1 on charts around the world and the video for which has racked more than 1 billion views on Youtube. 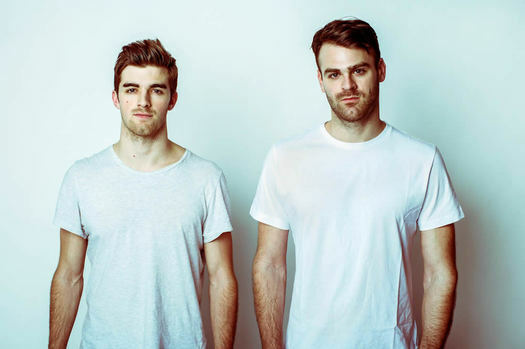 That sort of success has spun out articles such as "Chainsmokers: How Hard-Partying EDM Dudes Conquered the Mainstream" and "Why Is the Chainsmokers' "Closer" the Biggest Song in the Country?" Also on the bill for the TU Center show: Kiiara, K?D featuring Emily Warren. * That's one of the higher starting-at tickets prices around here that we can remember. Just looking up some other shows for comparison: The upcoming, multiple-sold-out Garth Brooks shows at the TU Center were $65.73. 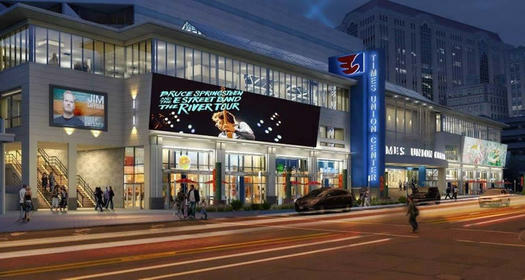 And the Bruce Springsteen show a the TU Center last year was $58 and up. 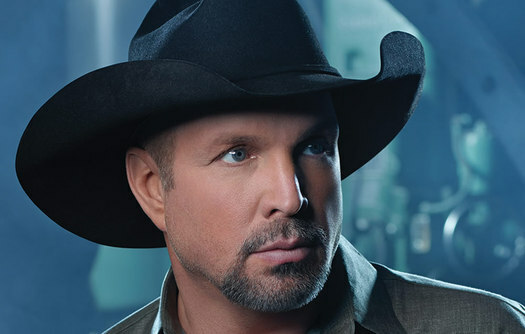 Tickets went on sale Friday for the the already-announced Garth Brooks/Trisha Yearwood shows at the TU Center in March. And the venue announced this morning it's adding two more shows. Here are the dates: March 10, 11, and 12. Tickets are $65.73. It sounds like there was an online crush to get the tickets this morning, but the TU Center was telling people Friday morning tickets were still available, and encouraging them to keep trying to get through. 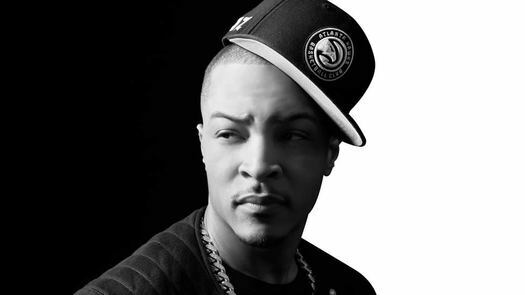 Lined up for the Times Union Center November 10: T.I. and Gucci Mane. Tickets went on sale this past Saturday -- they're $45 and up. The lineup for the show at the TU Center also includes Fetty Wap and Kent Jones. This is happening: A music tour called "I Love the 90's" is coming to the TU Center December 1. Tickets go on sale the general public this Friday (July 22) -- they're $56 and up. + "All right stop, Collaborate and listen"
+ "Coolin' by day then at night working up a sweat / C'mon girls, let's go show the guys that we know / How to become number one in a hot party show"
+ "I wanna rock right now /I'm _____ and I came to get down / I'm not internationally known / But I'm known to rock the microphone"
+ "Oh girl I think I love you I'm always thinkin' of you / I want you to know I do it all 4 love"
+ "As I walk through the valley of the shadow of death / I take a look at my life and realize there's none left / 'Cause I've been brassing and laughing so long that / Even my mamma thinks that my mind is gone"
+ "Workin' all week / 9 to 5 for my money / So when the weekend comes / I go get live with the honeys"
Check it out: The Albany All Stars and The Hellions of Troy will be facing off at the TU Center on June 4. It's the first time the two local roller derby orgs will go at it against each other on the track. There is, of course, some history here. 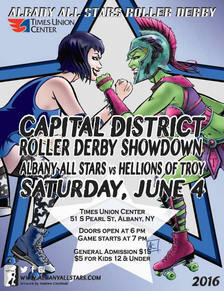 Back in 2008 the Albany All Stars Roller Derby had its first official bout at the Washington Ave Armory. And it was successful, drawing thousands of people. But later that year there was a derby schism and the Hellions of Troy broke off into their own org. Since then the two derby orgs have been operating in parallel here. Both groups are now part of the Women's Flat Track Derby Association, and they're separated by a just a handful of spots in the WFTDA rankings. The bout at the TU Center will be a home game for the All Stars. Doors open at 6 pm, the first whistle is at 7 pm. Tickets are $15 / $5 for kids 12 and under. There will be music from Diva & the Dirty Boys, along with activities and a raffle. A portion of the proceeds will go to the Food Pantries of the Capital District. A non-perishable food item will get you entered in a drawing for a prize. 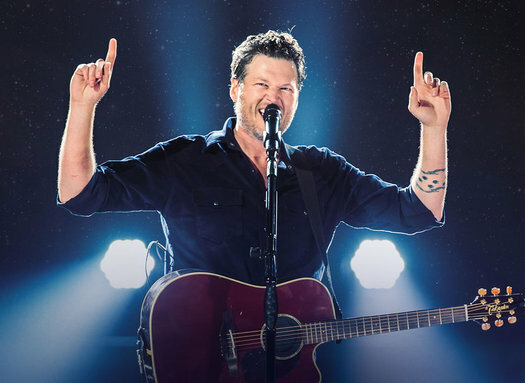 Country star Blake Shelton is set to play the TU Center September 29. Tickets go on sale this Friday, April 29 -- they're $39.75 and up. 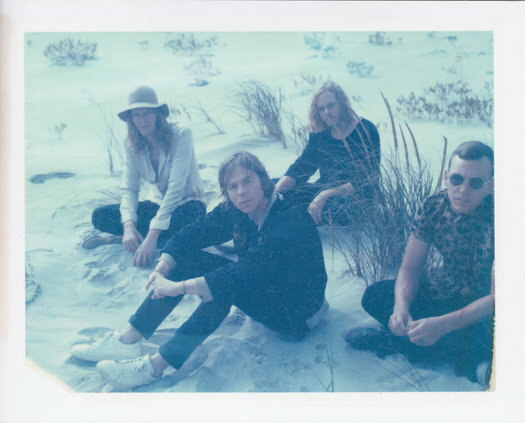 The rock band Cage the Elephant is set to play a show at the TU Center May 11. Tickets go on sale this Friday, March 18 -- they're $29.50 and up. Cage the Elephant was last through here in the summer of 2014 (for a show at UCH). 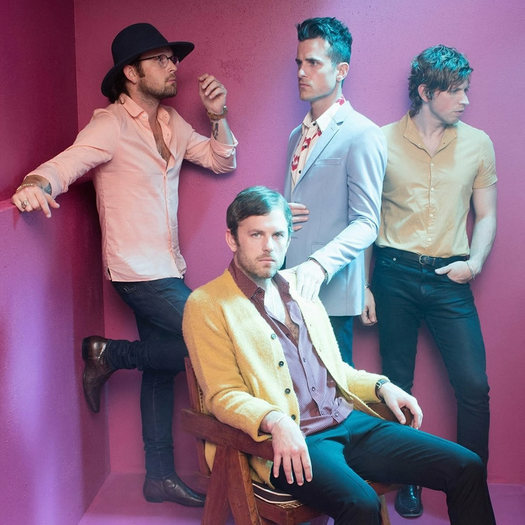 They're touring in support of a new album out this past December that was produced by the Dan Auerbach of The Black Keys. Also on the bill for the show: Portugal.The Man and Broncho. Also announced today: Lynyrd Skynyrd, with Peter Frampton, June 3 at the TU Center. Tickets on sale this Friday, March 18. Dead & Company -- featuring Grateful Dead members Bill Kreutzmann, Mickey Hart, and Bob Weir -- will be making a stop at the TU Center October 29. Tickets go on sale this Friday (August 28) -- they're $50 and up. The lineup for this tour is being filled out by John Mayer (yep, that John Mayer), along with bassist Oteil Burbridge and keyboardist Jeff Chimenti. Mayer has apparently been playing with members of the group since this past spring. 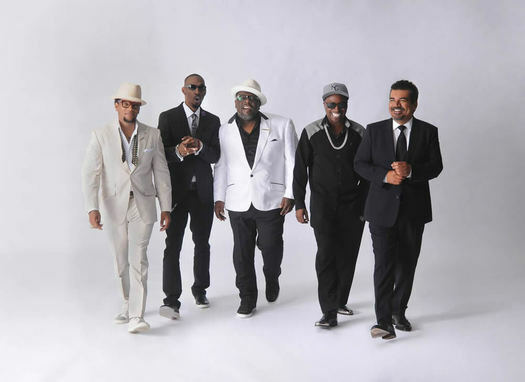 The show at the TU Center is the first stop on the group's 10-date tour. Other stops include Madison Square Garden (both dates already sold out), Philadelphia, DC, Worcester, San Francsico, and LA. You might have heard: Paul McCartney is playing a show at the TU Center July 5. Tickets go on sale April 14 at 10 am (there's also a presale via registration at McCartney's site) -- the price range is $39.60 to $269.90. 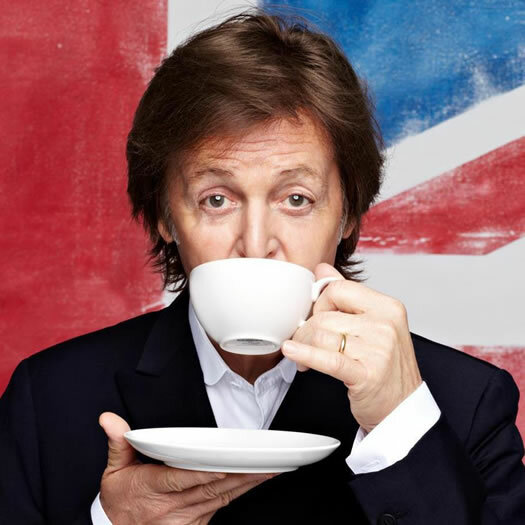 McCartney is now 71 years old. It's been 50 years since he and the rest of the Beatles first came to the US -- their famous appearance on The Ed Sullivan Show that year is said to have been watched by 73 million people (about 40 percent of the US population at the time). McCartney's tours continue to be very popular. His tour last year was the 16th highest grossing, according to Billboard -- $69.6 million on just 21 shows (with tickets sold at just a bit under 100 percent capacity). 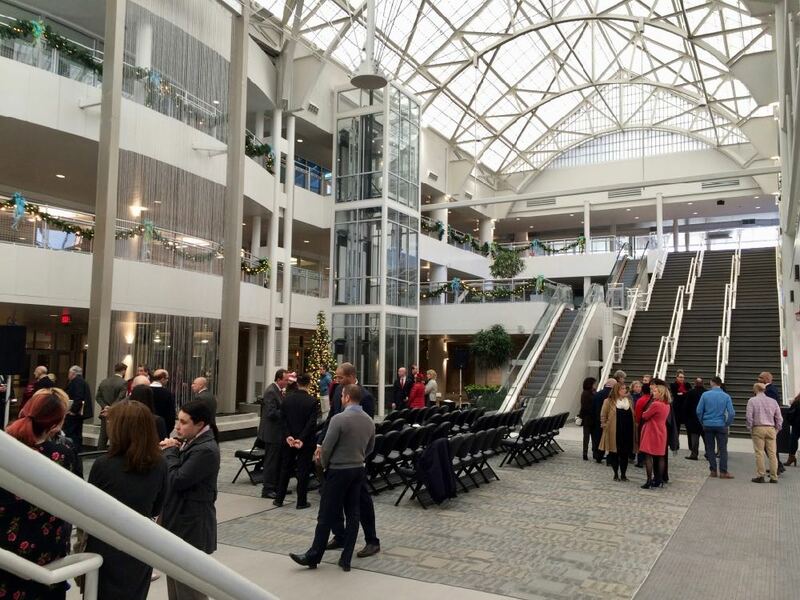 The TU Center had been touting this show as "the biggest event to come to Albany in the past decade," setting up the announcement for a press conference with local officials. And local media outlets were all buzzing about it Tuesday morning. That was especially so after mention of the date popped up on an "unofficial fan site" Facebook page for the McCartney tour, winning the FB page links from a bunch of outlets citing it as the official tour site. As it happens, it appears that "fan page" FB page is a front for a ticket brokerage and SEO company. 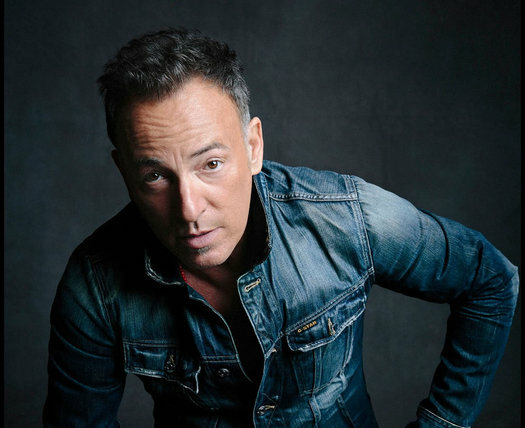 Announced this morning: Bruce Springsteen is set to play the TU Center May 13. Tickets go on sale this Friday (February 14) -- the price range is $38-$121. The show in Albany will be with the E Street Band, as you'd probably expect. Springsteen has been touring in support of his new album, High Hopes. The Boss last played Albany in 2012 at the TU Center. By the way: This is shaping up to be a year of big-name concerts at the arena. Among the shows this year: Kanye West (February 19), Justine Justin Timberlake (July 16), and Bruno Mars (July 20). 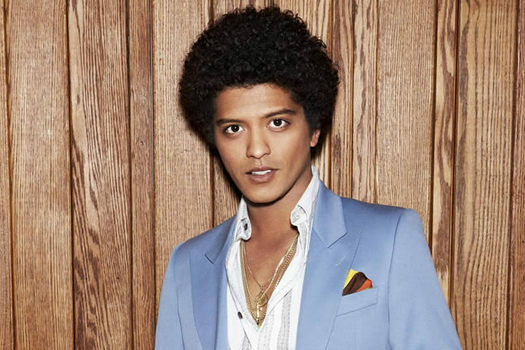 Pop star Bruno Mars is set to play a show at the TU Center July 20. Tickets go on sale February 3 -- they're $43 and up. Mars is one of the biggest pop acts currently in circulation. His most recent album hit #1 on the Billboard 200 chart. He's had five #1 singles. 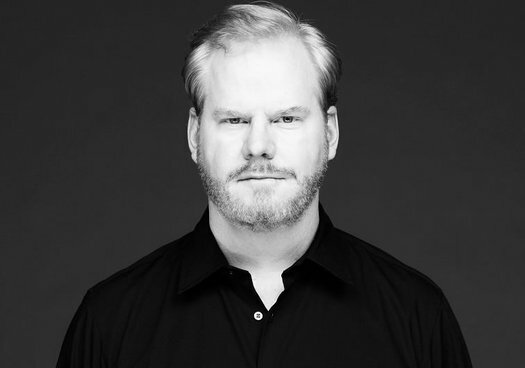 He pulled off the rare host-and-perform on SNL. He's nominated for song of the year and record of the year at this year's Grammys. And he's playing the Super Bowl halftime show this year. The opener for the July 20 show at the TU Center is Aloe Blacc. 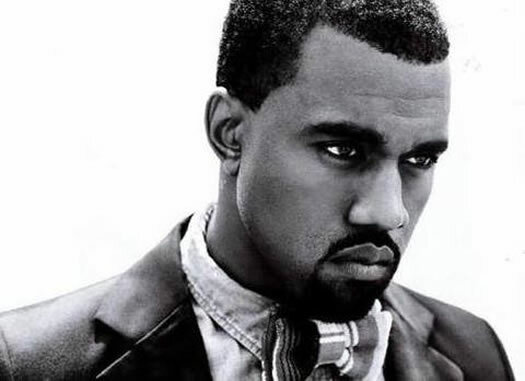 Just announced: Kanye West will play a show at the Times Union Center February 19. Tickets go on sale this Friday (January 10) at 10 am -- they're $49.50 and up. The Albany stop is part of two-week tour through the Northeast, an extension of his tour for Yeezus. It's a solo tour. There's a strong argument to be made that West is the biggest figure in pop culture now (it's gotta be him or Beyonce) -- because of his music, his public persona, his relationship. It's not every day/every year/every decade someone like that makes a stop in the Capital Region. 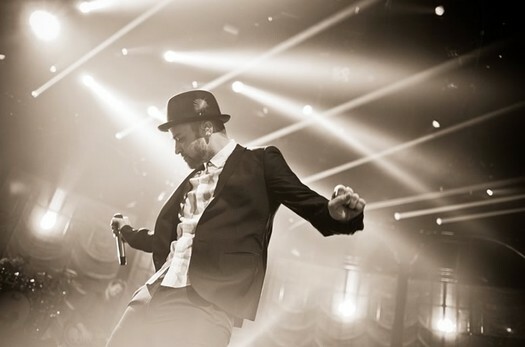 Announced today: Justin Timberlake will be playing a concert at the TU Center July 16, 2014. Tickets go on sale next Monday (November 18) at 10 am -- they're $48 and up. Back in the late 1990s if you had predicted that Justin Timberlake -- the guy from 'N Sync with the frosted tips who broke up with Britney Spears -- would end up being a hugely successful solo musical act and actor in 2013, it would have seemed unlikely. The trajectory post-boy band rarely takes such a successful direction. Yet here he is. 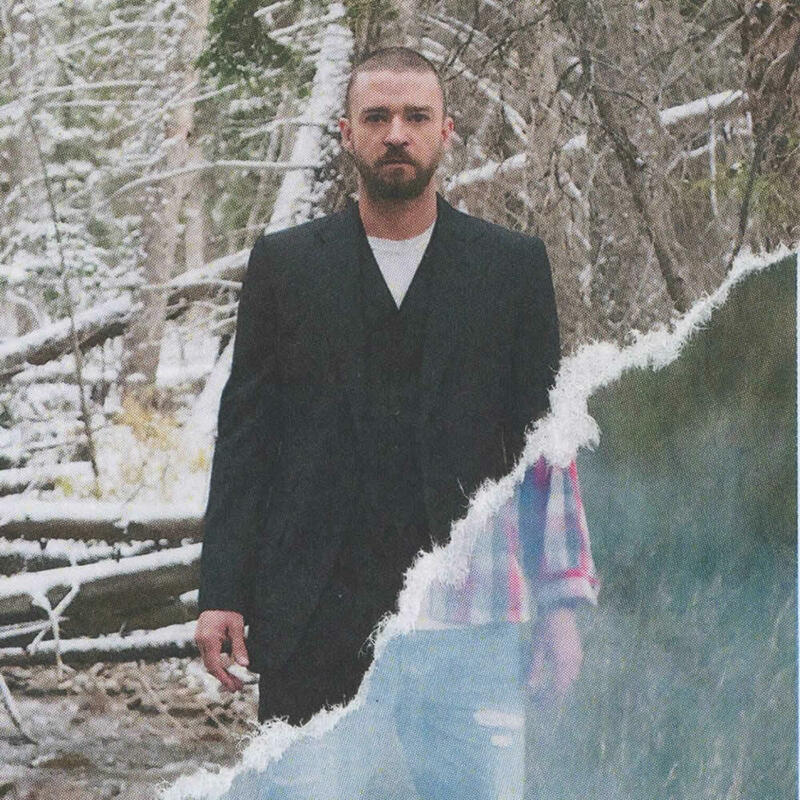 And Timberlake has even ended up with a public persona that's kinda funny and likable. 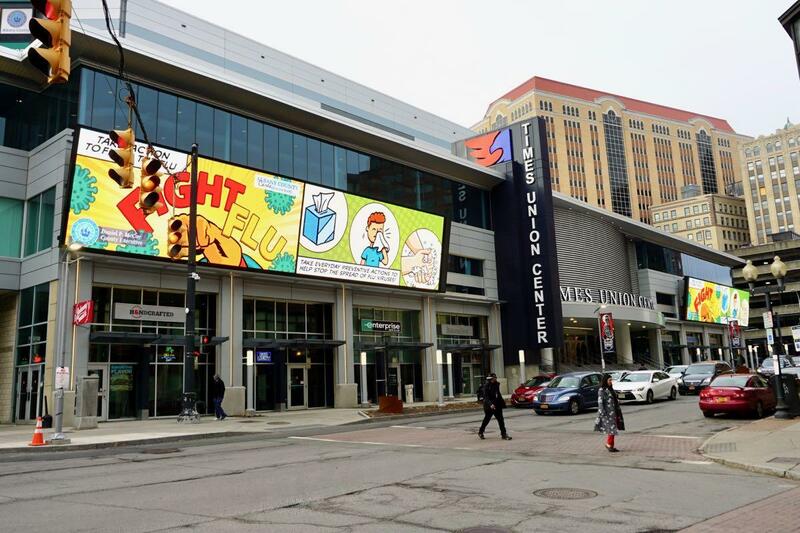 Through some sort of wrinkle in time, New Kids on the Block, Boyz II Men, and 98º have been transported from the 90s to the present day and will be at the Times Union Center August 1 for a show. Tickets for this time travel event go on sale to the general public February 23 -- they're $29.50 and up. Unfortunately -- and somewhat mysteriously given what little is known about time travel -- the transport from an earlier decade has aged the members of the three groups. When NKOTB emerged from the wormhole, reportedly it was as 40something men. And Nick Lachey was talking about how he excited he is to be dating Jessica Simpson. Sadly, Marky Mark didn't make it through the wormhole. Please join the Funky Bunch and Donnie Wahlberg in a moment of silence. Oh, and their fans? Haven't aged a day. Tenor Andrea Bocelli will be at the TU Center June 13. Tickets start at $78 -- they go on sale this coming Monday, January 28 (there's currently a pre-sale). The June 2013 Tour will come in support of Andrea Bocelli's upcoming release Passione which will be released on January 29, 2013 along with a brand new PBS television special of the samename in March 2013. Passione is a lush collection of Mediterranean love songs featuring duets with global pop stars Jennifer Lopez, Nelly Furtado, and the late Edith Piaf. Is it too much to hope for an Edith Piaf hologram? 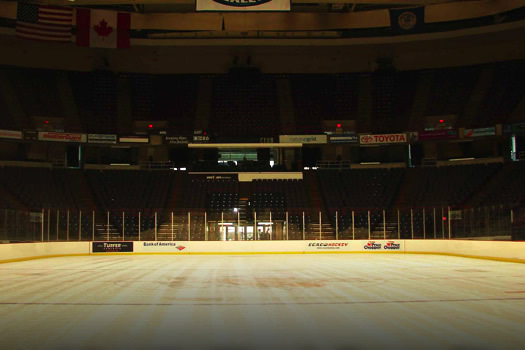 The show at the TU Center will probably sell out. And the upper end of the ticket price range is $353. Over at Nippertown, Greg notes some context for that price. Speaking of shows the PBS crowd is totally stoked about: "The Tenors" will be at the Palace May 4. Tickets start at $39.50 -- they go on sale to the public February 9. The quartet currently has the #1 album on the Billboard classical chart. Also: obligatory PBS special. Speaking of the Billboard classical chart: The current #2 album on the list is from Lindsey Stirling, who's playing at Upstate Concert Hall March 20. Of course, Stirling isn't really "classical" in the classical sense, other than the fact that she plays a violin -- she's famous for incorporating dubstep and playing covers of video game music. 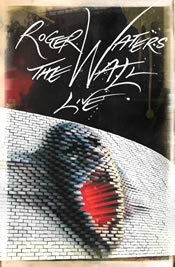 Roger Waters will be playing the classic Pink Floyd album The Wall at the TU Center June 28, 2012. Yep, that's a long time from now. But tickets go on sale November 14. They start at $58. Waters has been touring The Wall since last year. As you might expect, the show is apparently quite the spectacle. Here's Waters on why he touring the album. On the subject of old English rock stars: Peter Frampton is playing the Palace February 10. Just like you at your yoga class, right? Update: The drawing's closed. The winner has been emailed! Young ZoÃ© is bored; her parents, distant and apathetic, ignore her. Her life has lost all meaning. 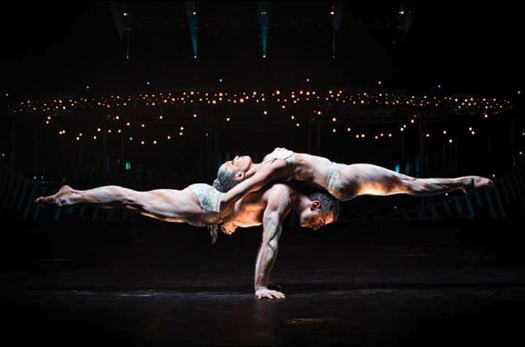 Seeking to fill the void of her existence, she slides into an imaginary world - the world of Quidam - where she meets characters who encourage her to free her soul. You know, through acrobatics and improbable flexibility. What local situation or place is a circus? Think broadly -- it could be anything crazy good or crazy bad. Example: the checkout lines at the supermarket ahead of an icy, snowy apocalypse. We'll draw one winner at random from the comments. Cirque du Soleil's "Quidam" will be at the TU Center Wednesday through Sunday. Tickets start at $30.50. Important: All comments must be submitted by 9 am on Tuesday (September 27, 2011) to be entered in the drawing. You must answer the question to be part of the drawing. One entry per person, please. You must enter a valid email address (that you check regularly) with your comment. The winner will be notified via email by noon on Tuesday and must respond by 6 pm that same day. 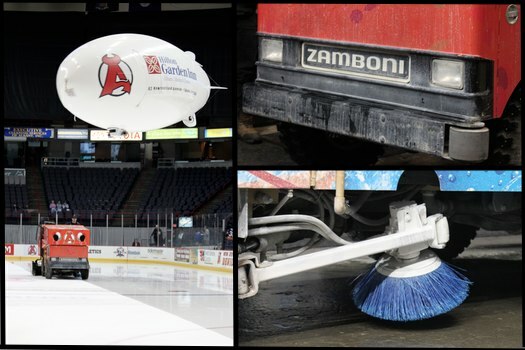 Part ice resurfacing machine, part intermission entertainment, it's no wonder everyone loves the Zamboni. The new team name: the Albany Devils. That's the logo on the right. We're now wondering what the mascot will be. Buzzy Beelezubub? Dev the Devil? Pitchfork Pete? The parent club's mascot is the creatively named...N.J. Devil. This is the second time New Jersey's had a team based here -- the Rats had been their minor league team for 13 seasons, ending in 2006. You know, so you can work on your triple lutzes. Admission is $5 for adults, $3 for kids 12 and under. (The tickets will only be sold day of.) Skate rental is $5. If you print out this flyer, you can park in the TUC garage for $3.